The twins were super excited to receive a special Hotel Transylvania 3 delivery from our friends at Sony Home Entertainment Pictures and Jazwares! A coffin arrived this week filled with all sorts of goodies for a family movie night. 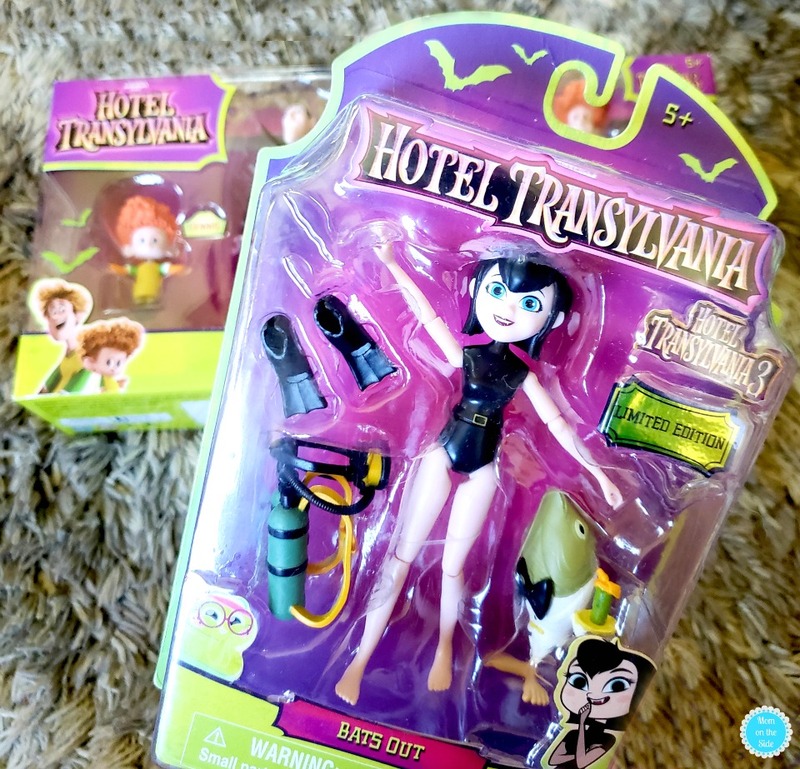 Hotel Transylvania 3 Toys, a Mavis Costume, and lots more! 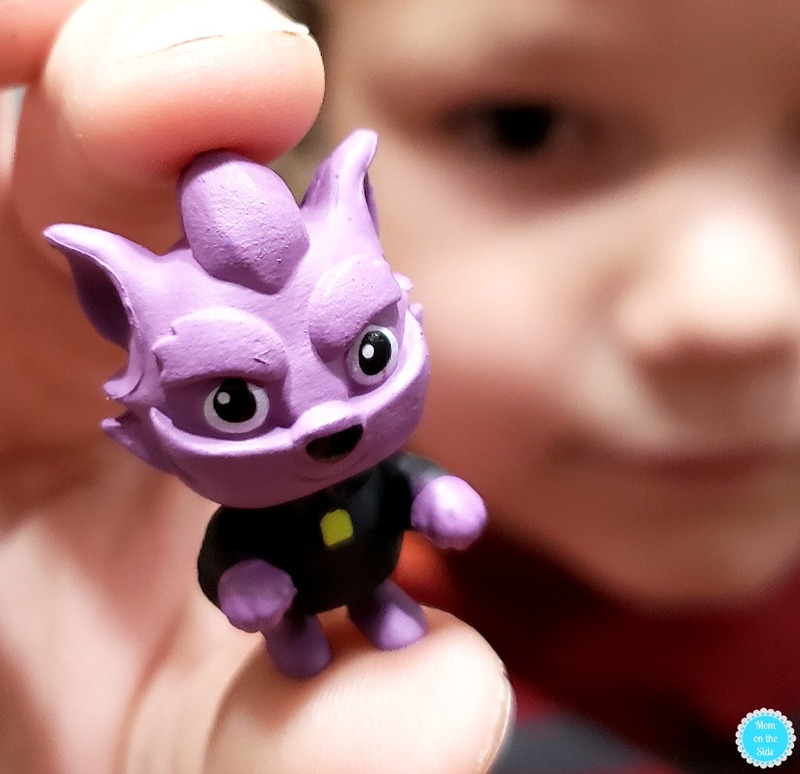 First, let me tell you about the new Hotel Transylvania 3 toys from Jazwares because obviously, that was the highlight of the coffin for the twins. They absolutely love all of the Hotel Transylvania movies, even though the first one came out before they were born. When we opened the coffin they squealed with delight and grabbed the Hotel Transylvania 3 action figures first. These are really nice quality with bendable body parts and easy to put on accessories. 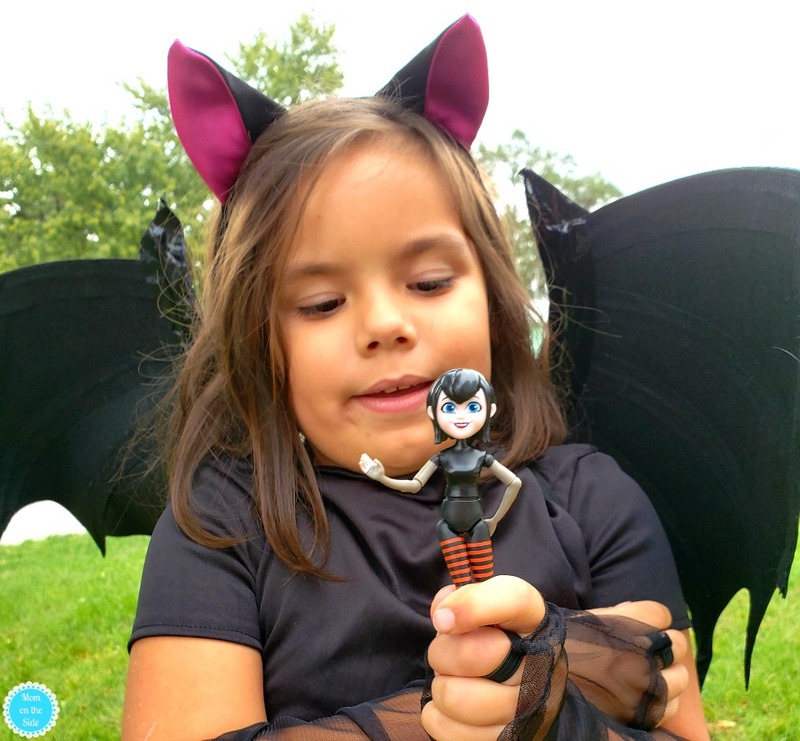 The two received were Spooky Scuba Mavis Action Figure and Drac’s Pack 4-Pack Action Figures. 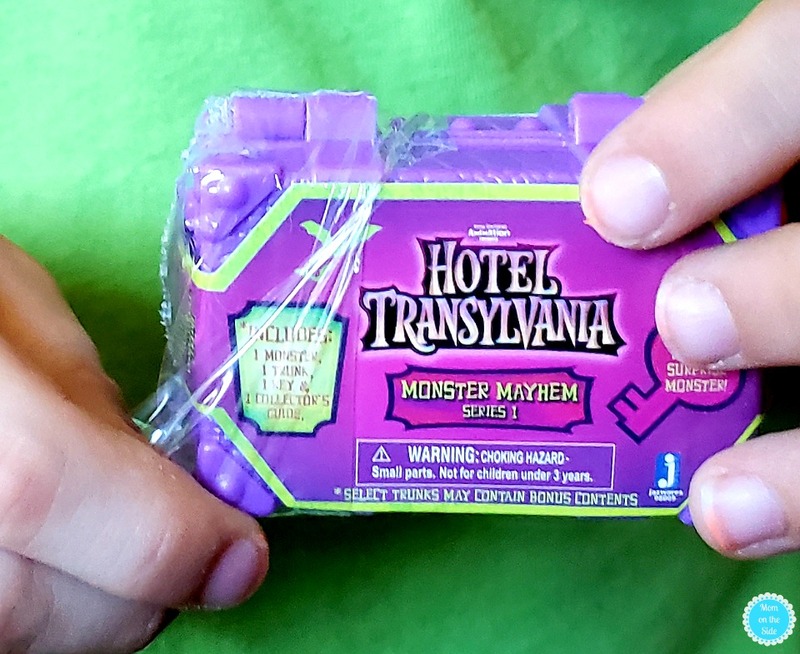 If your kids love blind bags like mine they’re going to love the Hotel Transylvania 3 Monster Mayhem Blind Collectibles we also received. Each one includes a trunk, key, and assorted collectible. I like that the key attaches to the side of the trunk so it’s easy to keep track of! 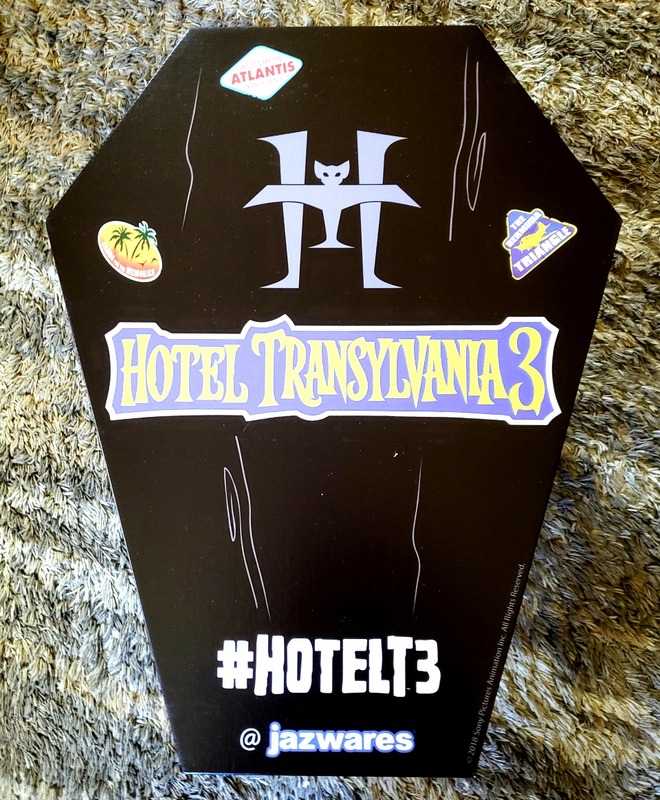 Inside our Hotel Transylvania 3 coffin, we also found a sweet Mavis Costume for Halloween! 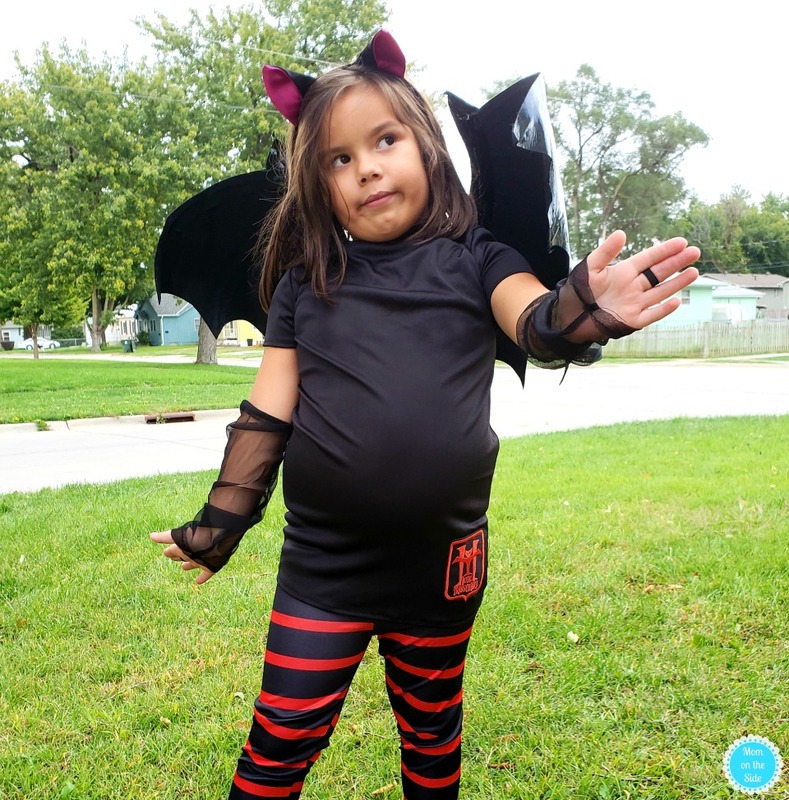 This Mavis Halloween Costume includes bat wings, bat ear headband, dress, pants, and gloves. It is available in several sizes and works great for playing dress-up long after Halloween is over! 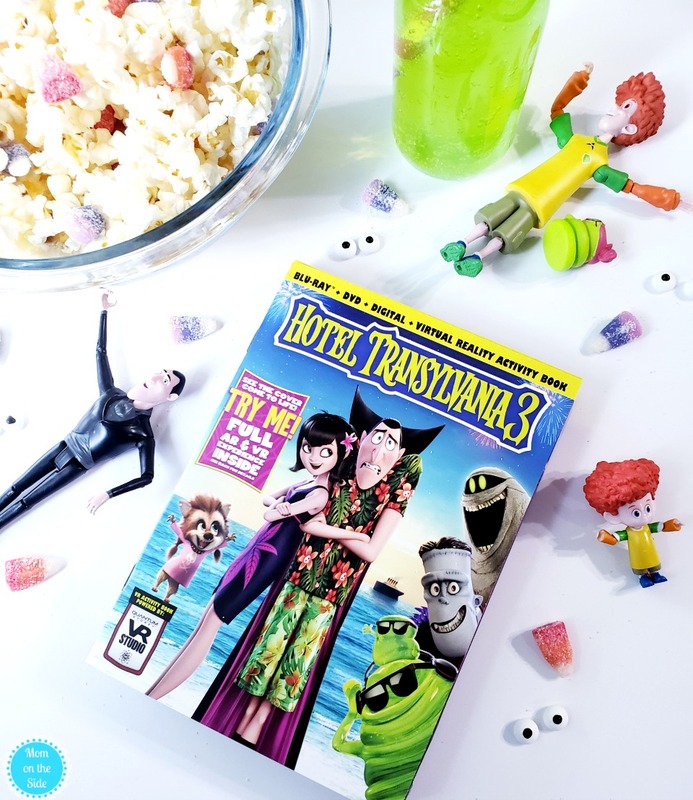 The Hotel Transylvania 3 Blu-ray Combo Pack releases on October 9th and it’s loaded with bonus features and fun! The edition we received is a Walmart exclusive that includes a Blu-ray, DVD, Digital Code, and Virtual Reality Activity Book with VR Goggles! 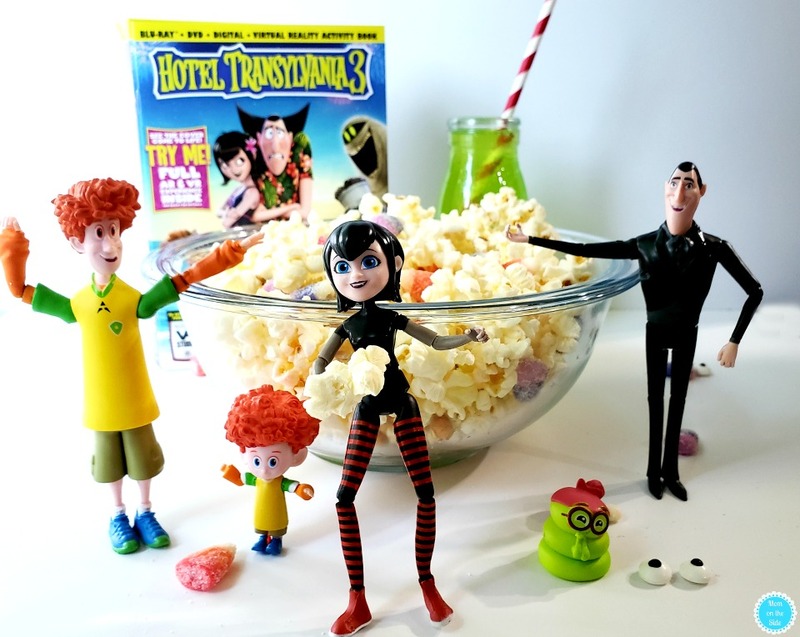 The all new, limited edition VR SKU of Hotel Transylvania 3 will have the Blu-ray, DVD and Digital versions of the film PLUS an activity book filled with AR and VR activities. 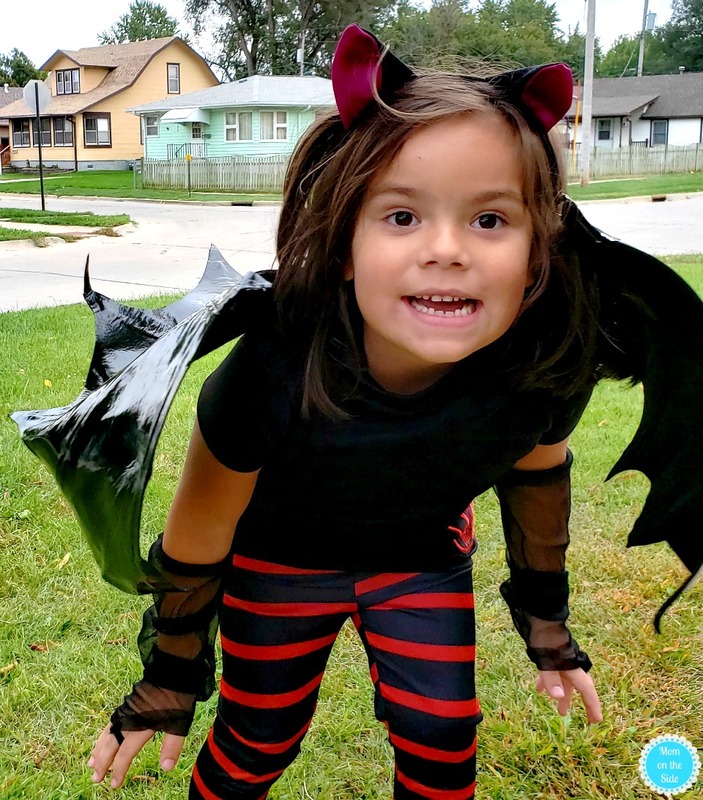 Just download the Hotel Transylvania 3 Virtual Reality Activity App, hold your phone over the cover and your favorite Monsters will leap off the page and into your heart! Plus the included VR goggles will let you jump into their zany world with 3 brand new VR experiences! 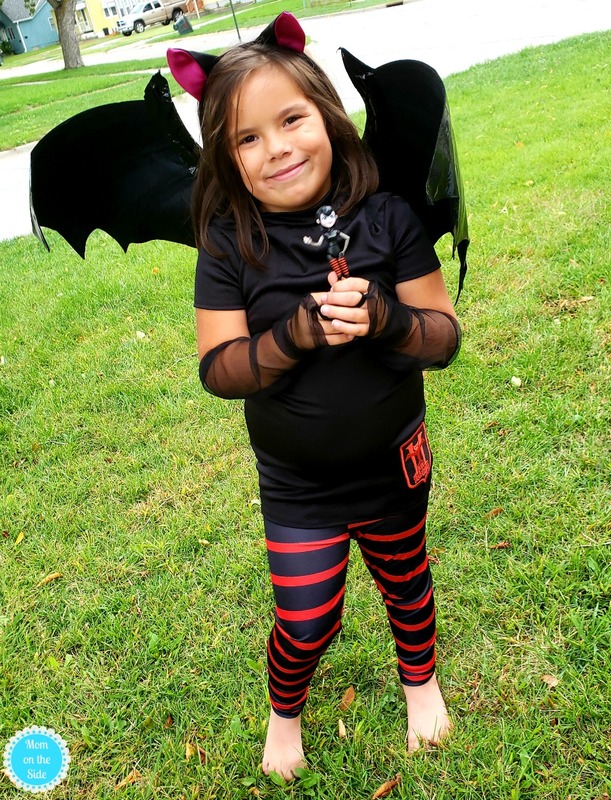 Monster Party Activities: Scary-oke Sing-Alongs, Lyric Video by Joe Jonas, Dance Along featuring Joe Jonas, Drac’s Zing-tastic Read Along, Mavis & Drac Monster Makeover Tutorial, Spook-tacular Sleepover Activities, and more! Plan a family movie night with a family-friendly movie that is perfect for October! Pop some popcorn and toss in some fun candy like the sour gummy candy corn I found that looks like Dracula teeth! 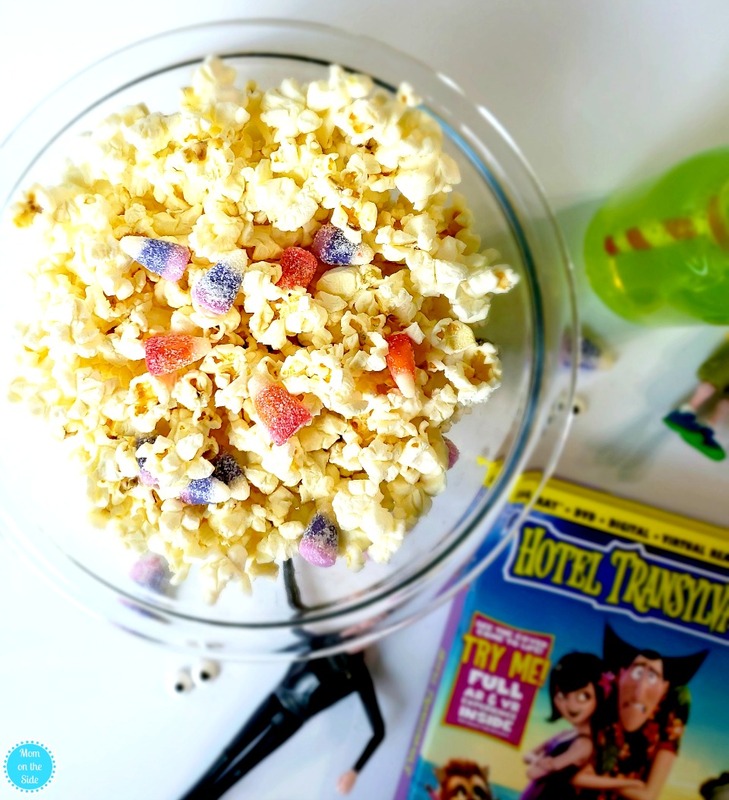 I even made a quick and easy Blobby Punch for our family movie night! Fill a glass with half green sports drink and half lemon-lime soda. Toss in a straw and sip away while watching Drac’s pack adventures on their family vacation! 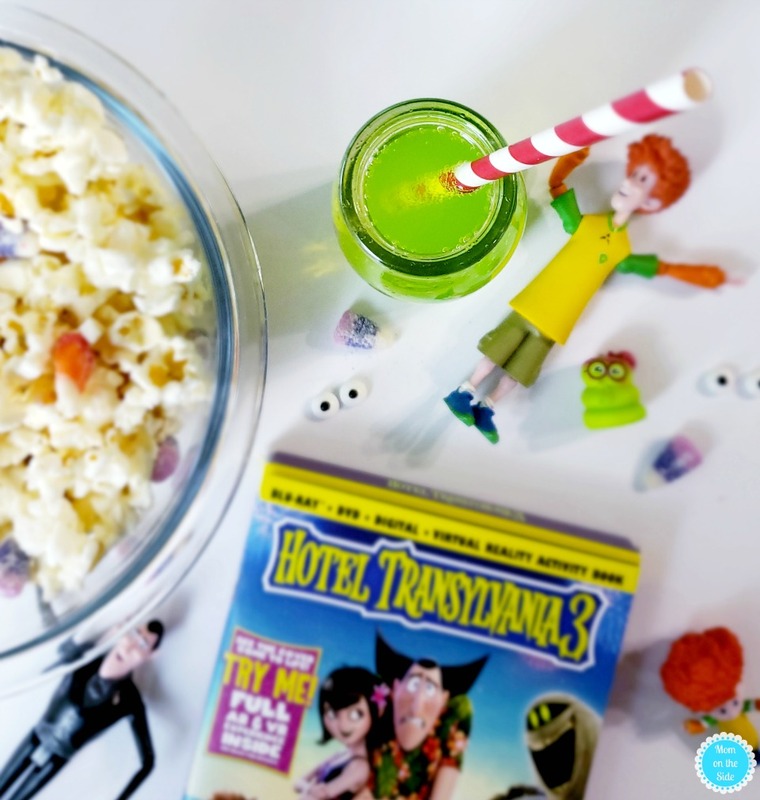 If you want more yummy ideas for a Hotel Transylvania 3 family movie night check out these recipes and printables! 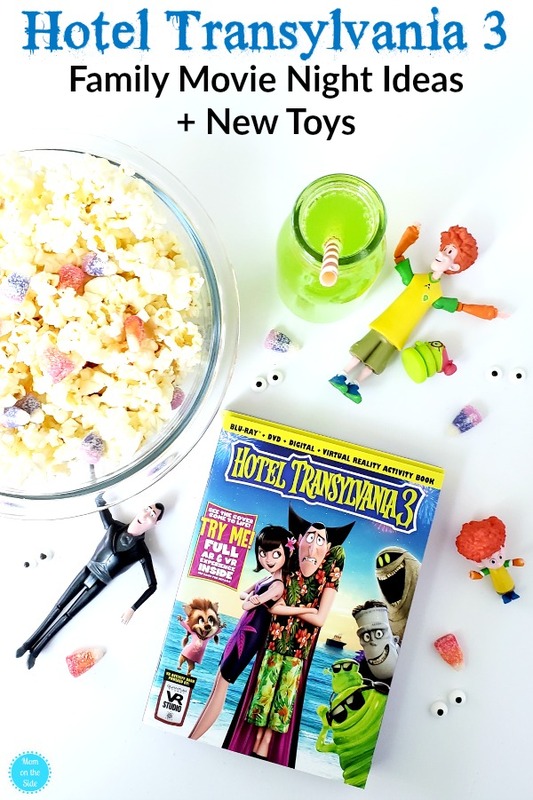 Are you ready for a Hotel Transylvania 3 family movie night?! Plus, grab these Hotel Tranyslcania 3 Pumpkin Stencil printables!